NEW YORK (AP) — A gunman who announced online that he was planning to shoot two “pigs” in retaliation for the chokehold death of Eric Garner ambushed two police officers in a patrol car and shot them to death in broad daylight Saturday before running to a subway station and killing himself, authorities said. The suspect, Ismaaiyl Brinsley, wrote on an Instagram account: “I’m putting wings on pigs today. They take 1 of ours, let’s take 2 of theirs,” officials said. He used the hashtags Shootthepolice RIPErivGardner (sic) RIPMikeBrown. 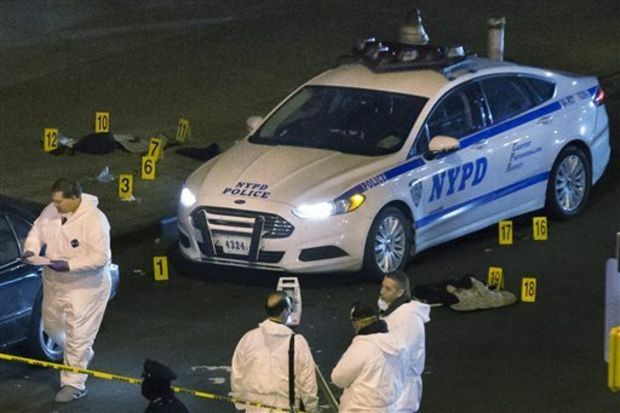 Police said he approached the passenger window of a marked police car and opened fire, striking Officers Rafael Ramos and Wenjian Liu in the head. The officers were on special patrol in the Bedford-Stuyvesant section of Brooklyn. “They were, quite simply, assassinated — targeted for their uniform. … They were ambushed and murdered,” said Police Commissioner William Bratton, who looked pale and shaken at a hospital news conference. Brinsley took off running and went down to a nearby subway station, where he shot himself. A silver handgun was recovered at the scene. “This may be my final post,” he wrote in the Instagram post that included an image of a silver handgun. The Rev. Al Sharpton said the family of Garner, killed by a police chokehold this year, had no connection to the suspect and denounced the violence. The shootings come at a tense time. Police in New York are being criticized for their tactics following the death of Garner, who was stopped by police on suspicion of selling loose, untaxed cigarettes. Amateur video captured an officer wrapping his arm around Garner’s neck and wrestling him to the ground. Garner was heard gasping, “I can’t breathe” before he lost consciousness and later died. Demonstrators around the country have staged die-ins and other protests since a grand jury decided Dec. 3 not to indict the officer in Garner’s death, a decision that closely followed a Missouri grand jury’s refusal to indict a white officer in the fatal shooting of Brown, an unarmed black 18-year-old. Earlier Saturday, Bratton said, Brinsley went to the home of a former girlfriend in the Baltimore area and shot and wounded her. Police there said they noticed Brinsley posting to the woman’s Instagram account about a threat to New York officers. Baltimore-area officials sent a warning flier to New York City police, who received it around the time of the shooting, Bratton said. A block from the shooting site, a line of about eight police officers stood with a German shepherd blocking the taped-off street. Streets were blocked off even to pedestrians. The president of the police officers union, Patrick Lynch, and Blasio have been locked in a public battle over treatment of officers following the grand jury’s decision. Just days ago, Lynch suggested police officers sign a petition that demanded the mayor not attend their funerals should they die on the job.